High Street from Country Market Place with the procession in commemoration of the death of General George Washington, by William Birch, 1800. After Washington's death, Congress set December 26, 1799 as a national day of mourning, and prepared for a formal commemoration in Philadelphia, the nation's capital. 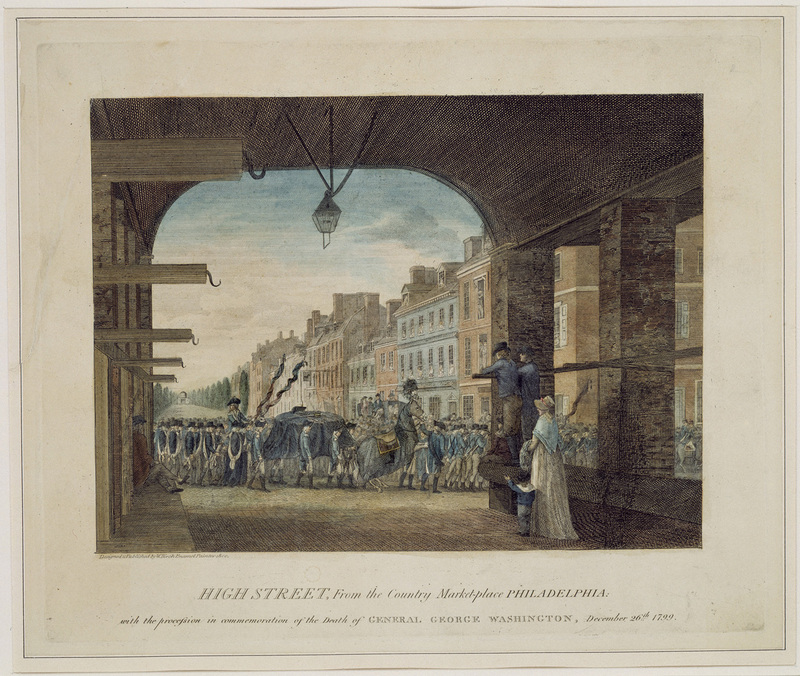 This William Birch etching captures the funeral procession on Fourth Street, where a riderless horse is followed by an empty bier topped by swords and a tricorn hat. (In the background one can see the City Waterworks, on the site of present-day City Hall.) As cannon fired in Philadelphia on the 26th, a process of deification began, criticisms were forgotten, and Washington became the greatest of American heroes.